Franz Ferdinand are Scotland very own indie rock stars, after huge success in the UK they are now bringing their music to the US, what is undoubtedly their biggest tour ever! They are storming into the The Wiltern on the 29th April, don't miss out, get your tickets now! 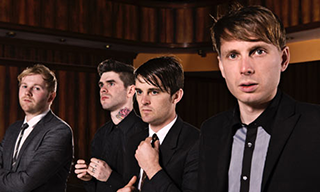 Franz Ferdinand are a Scottish indie rock band formed in 2002, and based in Glasgow. The band is composed of Alex Kapranos (lead vocals and guitar, keyboard), Bob Hardy (bass guitar), Nick McCarthy (rhythm guitar, keyboards and backing vocals), and Paul Thomson (drums, percussion and backing vocals). After the initial success of their first album they went on to win the 2004 Mercury Music Prize and two BRIT Awards in 2005 for Best British Group and Best British Rock Act. Don't miss this platinum selling artist live!